Details supplied by Ira B. Matetsky from a copy at Harvard (Widener Library). 178 · Tales of a Term I.Court-Martialled · Max Rittenberg · ss The Strand Magazine Feb 1911; illustrated by H. M. Brock, R.I.
180 · Tales of a Term II.The Revolt · Max Rittenberg · ss The Strand Magazine Feb 1911; illustrated by H. M. Brock, R.I.
184 · Tales of a Term III.The Worm That Turned Out Trumps · Max Rittenberg · ss The Strand Magazine Feb 1911; illustrated by H. M. Brock, R.I.
191 · Grigsby, Antiques · Edward Cecil · ss The Strand Magazine Feb 1911; illustrated by Dudley Hardy, R.I.
201 · Beautiful Portraits of Well-Known Actresses · Anon. · ar; begins Miss Julie Sanders and ends Miss Gertie Miller. 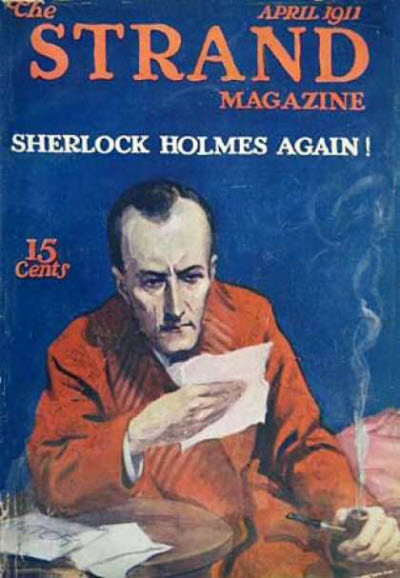 The cover depicts Sherlock Holmes, smoking his pipe and reading a piece of paper with the headline Sherlock Holmes Again!. Details supplied by Ira B. Matetsky from the New York State Library. 290 · A Reminiscence of Sherlock Holmes: The Adventure of the Red Circle [Part 1 of 2; Sherlock Holmes] · Arthur Conan Doyle · ss The Strand Magazine Mar 1911; illustrated by H. M. Brock, R.I. & Joseph Simpson, R.B.A. 332 · Water-Spidersand How They Became So · John J. Ward, F.E.S. · ar The Strand Magazine Mar 1911; illustrated by John J. Ward, F.E.S. 384 · A Prisoner of Providence · Frank E. Verney · ss The Strand Magazine Mar 1911; illustrated by Dudley Hardy, R.I. The cover depicts a woman leaning on some sort of furniture. Details supplied by Ira B. Matetsky from the New York State Library. 456 · The Great Food Question I.The Way Out · Max Rittenberg · ss The Strand Magazine Apr 1911; illustrated by H. M. Brock, R.I.
461 · The Great Food Question II.The Poetic Justice · Max Rittenberg · ss The Strand Magazine Apr 1911; illustrated by H. M. Brock, R.I.
479 · His Deputy · E. M. Jameson · ss The Strand Magazine Apr 1911; illustrated by W. H. Margetson, R.I.
528 · The Last Chance · Barry Pain · ss The Strand Magazine Apr 1911; illustrated by Dudley Hardy, R.I. The cover depicts a picture of A Venus of the Stage. Details supplied by Ira B. Matetsky from the New York State Library. 578 · Burdons Tomb · Barry Pain · ss The Strand Magazine May 1911; illustrated by Dudley Hardy, R.I.
632 · The Creation of a Venus · Anon. · ar The Strand Magazine Apr 1911; illustrated by Hal Hurst, R.I.
748 · An Artificial Artist · Frederic Lees · ar The Strand Magazine Jun 1911 [Pierre Gillo]; on an automaton artist. 814 · The Outcast · E. Phillips Oppenheim · ss The Strand Magazine Jun 1911; illustrated by Dudley Hardy, R.I.
824 · Flashlighting · Frederic G. Hodsoll · ar The Strand Magazine Jun 1911; on night photography. The cover depicts a night scene of a man and woman in evening dress on a balcony above a fountain. Details supplied by Denny Lien from an online copy at HathiTrust. 39 · Mr. Macfadyen, Mortal · Arthur Morrison · ss The Strand Magazine Jul 1911; illustrated by Dudley Hardy, R.I.
126 · A Pack of Cards: Its Stories, Legends, and Romances [Part 1 of 2] · Anon. 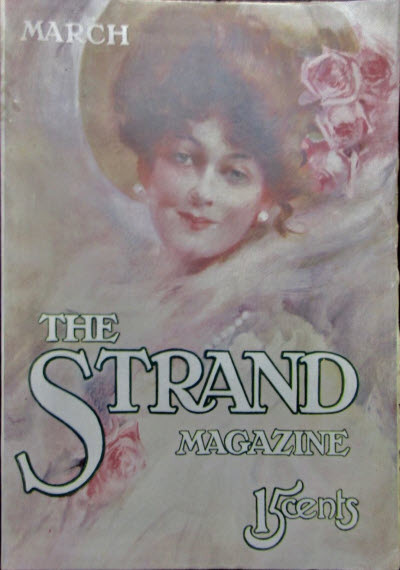 · ar The Strand Magazine Jul 1911; legends of hearts and diamonds. The cover depicts a woman playing piano. Details supplied by Denny Lien from an online copy at HathiTrust. 219 · The S.P.B. · J. Willsher · ar The Strand Magazine Aug 1911; re Society for the Propagation of the Beard. 231 · A Pack of Cards: Its Stories, Legends, and Romances [Part 2 of 2] · Anon. · ar The Strand Magazine Aug 1911; legends of spades and clubs.